Karate is a traditional martial art and a form of self defense, that came to Southern Japan presumably in the 14th Century from China and soon developed into a highly unique Japanese martial art. Modern Karate, as we find it in Germany today, has its roots only in the 30s of the 20th century when it made its way from Okinawa to the Japanese mainland and from there in the 60s into the whole world. 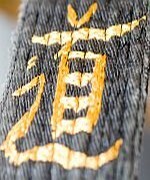 "Karate" literally means "empty hand" and is composed of the Japanese character "kara" (empty) and "te" (hand ). But this notion does not only refer to the ability of a karateka to defend himself without weapons but also, in a figurative sense, to the idea of an empty mind while practising this martial art. The main fighting techniques of karate are different punching and kicking techniques that are practiced both with a partner and individually. Also leverage techniques and throwing techniques are used. As a rule, all attacks on the body in the training are stopped before contact, so that the risk of injury is very low. The common image of breaking wooden boards with Karate techniques has in fact little to do with the common training!